Graduate Management Aptitude Test is the test of the writing, quantitative, verbal, analytical reading skill in the English language which is intended for the admission to the graduate management programs or MBA. And to study for the GMAT, there are various options available and what is widely preferred by the most of the students is the official guide for GMAT which is prepared specifically for the purpose of this exam by the official authorities. It is the ultimate preparation kit from the makers of the GMAT exam. And hence you will get the best of the success strategies and test-taking tips from the specialists at the Graduate Management Admission Council. And not only this but also the in-depth grammar and math review questions. This edition of the book contains more than 900 retired GMAT questions and answered explanation and this time about 15% of the content and questions in the book are fresh. Along with a diagnostic test, you will also get six months’ access to 50 online integrated online questions and their explanations. For More Books Here are the top best GMAT preparation material. If you have already prepared for the GMAT once and now you are preparing for the re-take, then you can buy this book as it has got new questions as compared to the previous edition. But if you are going to have your first attempt and you already have any previous edition of this book, then it’s better that you go through that book properly and after that, if you want to practice more questions from the official guide then this book can be at your service. The book is designed to give you a personal level guide to the work upon your strength and weakness to increase your potential and hence your score. The best part that I found about this study guide is its unique option to create your own test paper which can be focused to improve your weaker sections. Also, the diagnostic test helps you prioritize your time. 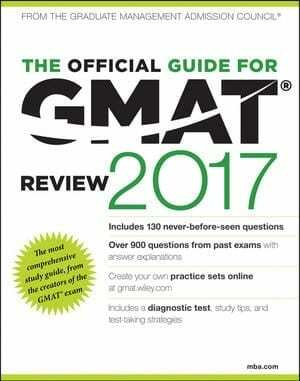 This edition of the review guide for GMAT has some never seen before study materials and questions which are unique and relevant to the full description to enhance your practice level. Since GMAT is considered to be among very tough exams, so it’s better that you prioritize your time well and focus on your weaker section to help maximize your score as this is what finally matters. And this book is very effective in finding your weaknesses and strength. The official guide for GMAT has all the mistakes revised from the first edition and hence you can be sure enough to get an error-free preparation. You can, but this book from the Amazon at 28.14 USD, and this is the good buy if you take a look at all the features of this book. So, if you are aspiring to get admission in some of the best business schools in the world, then the most important thing that can take to there is this book.